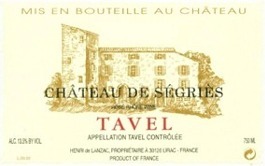 Segries Tavel Rose is made from 50% Grenache, 30% Cinsault, 15% Clairette, 5% Syrah. The age of the vines is 30 years. Traditional vinification at low temperature, "vin de saignée" with a maceration during one night in cement vat. This is large for a Rose...structured and focused, with the color of dark ruby. The nose is loaded up with fresh fruit. Strawberry, blackcurrant, and raspberry beam from the glass. On the palate, the mouth-feel is ripe and succulent. It has strength, but maintains its fresh and crisp expression. The finish is filled with Asian spice and slight hints of smoke. Drink this juice now or over the next year or two. - 7 ha (17.30 acres) in Tavel, on limestone, pebble stone, sand and clay based soils. - 30 ha (74.10 acres) in Lirac, on clay and limestone based soils. - 4 ha (9.88 acres) in Cotes du Rhone. - 3.5 other ha (8.65 acres) in Cotes du Rhone for the "Clos de l'Hermitage"